1. The original platypus specimen is held at the London Museum of Natural History. It has several scars because when it was first examined, scientists thought it was a hoax by some pranksters who they believed to have connected parts of various animals together. 2. Male platypuses have a sharp spur on the ankles of their hind legs. These spurs are venomous and it can incapacitate humans or even kill small animals. 3. Platypuses were hunted in the 1900s for their fur. 4. When a platypus swims, its nostrils, ears and eyes close. The forefeet help propel it forward and its hind feet are used for braking and steering. 5. The diet of a platypus typically consists of worms, flies, small shrimps, insect larvae and small marine creatures. 6. The platypus has to consume about a one-fourth of its body weight every day to survive. As a result, they spend about 12 hours each day searching for food. 7. Female platypuses have two ovaries, but only one of them is functional. 8. In captivity, the platypus has been known to live for 17 years. 9. The mating season for the platypus is from June to October. 10. It takes about 28 days for a platypus egg to fully develop. The incubation period lasts for approximately 10 days. 11. The technical name for the platypus – ornithorhynchus anatinus – means “bird snout” and “duck-like” in Greek. 12. There is no specific term used for the plural of platypus. The accepted terms include platypus, platypuses, and platypoda. 13. 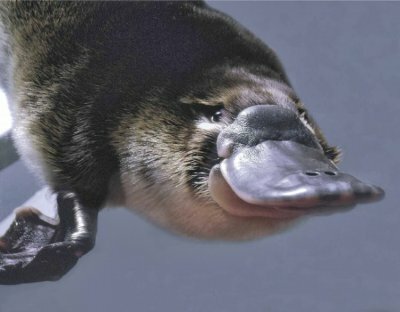 The platypus is a monotreme, which means that it has one opening that is used for defecating, urinating, and reproducing. 14. The platypus is found on the continent of Australia where it lives in freshwater streams, tropical lowland rivers, and similar areas. 15. Platypuses lay eggs, making them one of the three mammals on earth that lays eggs. 16. A female platypus lays between 1 and 3 eggs, but usually it is 2 eggs. These eggs have a leathery and sticky texture. During the incubation period, the mother curls her body around them so they can stay warm. 17. The male platypus measures about 20 inches in length while the female platypus typically measures about 17 inches in length. 18. The main predators of the platypus include water rats, eels, owls, hawks, eagles and snakes. In some areas of Australia, the dingo is another predator of the platypus. 19. Platypuses are typically quiet, but they do have a growl-like sound when they are threatened or angry. 20. A platypus can only stay underwater for 1 to 2 minutes at a time. As a result, they will dive for their food and then bring it up to the surface of the water to eat it. 21. Platypuses store fat in their tails. They can use this fat to help them survive when food is scarce. 22. While walking on land, the webbing in the platypus’s feet retracts and the claws become more prominent. 23. Platypuses live in burrows, which are holes dug near the edge of rivers and streams. These burrows can be as long as 100 feet and they can be quite complex. 24. There is only one recognized species of platypus. 25. Baby platypuses are often referred to as puggles.